Red Rock Welcome Sign. Image available on the Internet and included in accordance with Title 17 U.S.C. Section 107. Red Rock Christian Church. Image available on the Internet and included in accordance with Title 17 U.S.C. Section 107. RED ROCK, TEXAS (Bastrop County). Red Rock, twelve miles southwest of Bastrop in southwestern Bastrop County, is said to have derived its name from a red rock used in building the chimney of first settler James Brewer's house in the early 1850s. During its early days the settlement was apparently also called Hannah Land. A Red Rock post office was established in 1870. By the mid-1870s the Red Rock Male and Female Academy was in operation, and Red Rock residents were entertaining the populace of surrounding towns with a community dramatic troupe. 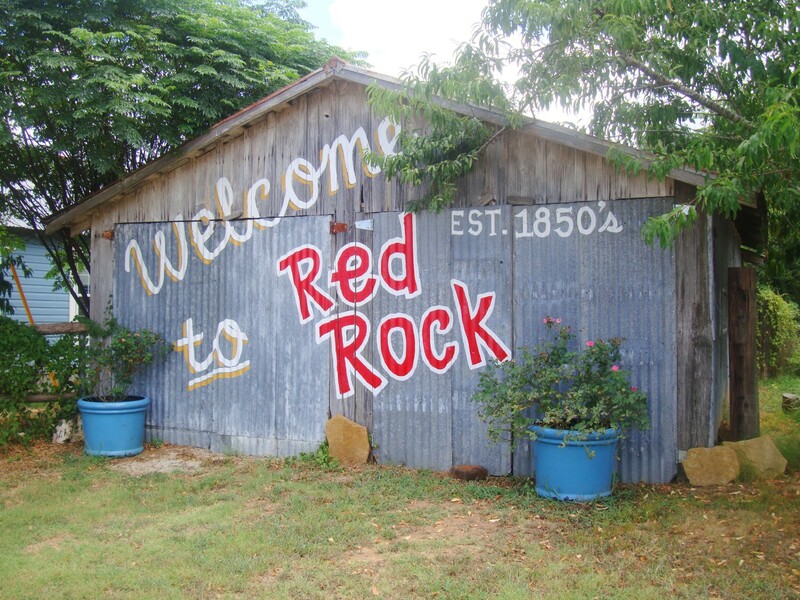 Red Rock was described in 1879 as a "thriving village," and five years later it had a population of 150, a steam gristmill, and a cotton gin. Around 1890 the Missouri, Kansas and Texas Railroad extended its line, and the community moved a mile to meet it. Red Rock then had 200 people, the gristmill and gin, three general stores, a drugstore, and a dry goods store. The early years of the twentieth century brought a wave of growth to the community. A 1909 newspaper estimated the population at 500 and called Red Rock "a splendid cotton market." The town had a bank with assets close to $60,000, and the cotton gin was processing 2,500 bales annually. 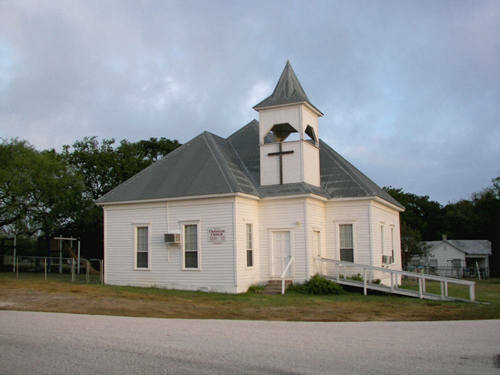 In 1914 the community's population was reported as 350, and it had Christian churches. During the 1920s the Red Rock area became an oil-drilling site, with wells developed by the mid-1930s. No boom in population resulted, however, and the community remained primarily a center for agriculture and cattle raising. The population dipped to 100 in 1940, then increased to 250 and remained steady for the next two decades. In the late 1960s it again dropped and was estimated at 100 through 1990. In 2000 the population was 125. Bastrop Historical Society, In the Shadow of the Lost Pines: A History of Bastrop County and Its People (Bastrop, Texas: Bastrop Advertiser, 1955). Bill Moore, Bastrop County, 1691–1900 (Wichita Falls: Nortex, 1977). Handbook of Texas Online, Paula Mitchell Marks, "RED ROCK, TX (BASTROP COUNTY)," accessed April 22, 2019, http://www.tshaonline.org/handbook/online/articles/hlr06.